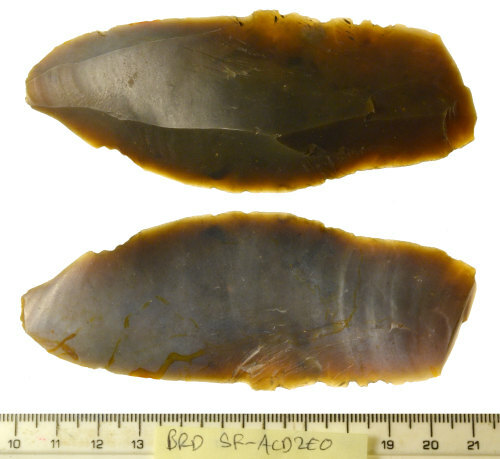 A patinated flint long flake or blade of possible final Upper Palaeolithic to Mesolithic date. It is struck from a grey/brown flint with partially patinated blue/grey surfaces. The proximal end has a hinge fracture and the distal end has a small area of unpatinated semi-abrupt and scaled retouch on the ventral face. The dorsal face has parallel flake or blade scars and both edges appear to have sigs of possible 'bruising'. It measures 108.66mm in length, 43.94mm in width, 14.77mm in thickness, and 50.90g in weight. This is a flint long flake or blade. It forms one part of a larger assemblage of flint blades, flakes, and tools, all found together on spoil excavated from a single pit during the construction of a soakaway. The complete assemblage finds close parallels to excavated long blade assemblages and industries in the surrounding landscape, most notably those recently published in the immediate vicinity at Brandon (E. Martin in Tester et al., 'Staunch Meadow, Brandon, Suffolk' EAA 151, 2014: p. 26). The presence of long blades (backed blades and bruised blades/lame mâchurée) within the assemblage suggests at least a Mesolithic date for the group, potentially extending into the final stages of the Upper Palaeolithic, perhaps c.12,000-4,000 BC.